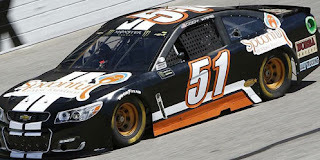 Cody Ware picked up the 1st last-place finish of his Monster Energy NASCAR Cup Series career in Sunday’s Folds of Honor QuikTrip 500 at the Atlanta Motor Speedway when his #51 Spoonful of Music Foundation Chevrolet fell out with steering problems after 74 of 325 laps. The finish came in Ware’s series debut. Following a difficult SpeedWeeks where the team lost a lap during Duel Race 2, then pulled off the track, Rick Ware Racing had much to look forward to at Atlanta. The team’s #51 Chevrolet was one of just 38 entries for 40 spots, the shortest field for a Cup race at Atlanta since November 1976, and the subsequent addition of Corey LaJoie’s #83 Dustless Blasting Toyota on Tuesday still guaranteed the Ware team its first Cup start since 2012, as well as a start in NASCAR’s 2,500th Cup Series race. Driving duties would this time fall to Ware’s son Cody, who made the move from modifieds to XFINITY and Truck competition in 2014. The short field was also a boon to the younger Ware, who made his first Cup attempt at Sonoma last June, but ended the up the only car bumped from the field. His ride in Atlanta would again carry sponsorship from the Spoonful of Music Foundation and Bubba Burger, but now on a black car with white stripes instead of Daytona’s white with black. The tough, slippery Atlanta surface proved a challenge for driver and team. Ware was slowest overall in both practice sessions, and in qualifying joined four other drivers (Michael McDowell, Cole Whitt, Jeffrey Earnhardt, and Derrike Cope) who did not complete a timed lap. This gave Ware the 39th and final starting spot in the field. Cope, who lined up 38th, was making his first start in a Cup points race since October 2009 at Martinsville and his first at Atlanta since 2004. The deal to drive Premium Motorsports’ #55 Wade Tractor and Equipment Chevrolet came together after news that the driver was pulling out of the XFINITY Series. However, around Lap 65, Ware returned to the track 35 laps down, and could be seen trying to catch the pack as the leaders restarted following Stage 1. First Cope, then LaJoie then found trouble from an oil line and contact with the wall, respectively, but neither lost enough laps to challenge Ware for 39th. Around Lap 109, Ware had been advised by NASCAR to meet minimum speed and pulled behind the wall a second time, having completed 74 laps. On Lap 150, FOX listed Ware as “OUT” for a second time, and this time the #51 did not return. Finishing 38th on Sunday was Denny Hamlin, whose #11 FedEx Ground Toyota broke a rear end, returned with 77 laps to go, then pulled off once more when 37th-place Gray Gaulding lost the motor on his #23 Dr. Pepper Toyota. 36th went to Cope, the last car to finish under power, 27 laps behind the leaders. The three-time LASTCAR champion remains fourth in Cup last-place rankings. 16 circuits behind in 35th was a frustrated Ryan Newman, whose #31 Caterpillar Chevrolet started outside-pole and enjoyed a strong Top 10 run until battery issues forced him to the garage area. *This marked the first Cup Series last-place finish for the #51 at Atlanta, and the first in a Cup race since May 24, 2015, when Justin Allgaier’s Brandt Chevrolet fell out with crash damage after 135 laps of the Coca-Cola 600. *Ware’s last-place finish came in the 2,500th NASCAR Cup Series race, making him the 853rd driver to trail at least one of those events. 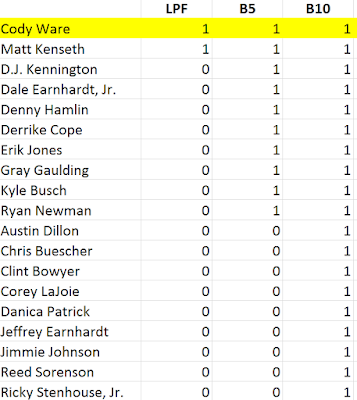 *Ware is the first Cup Series driver to finish last due to steering issues since last September at New Hampshire, when Michael Annett pulled out after 236 laps. 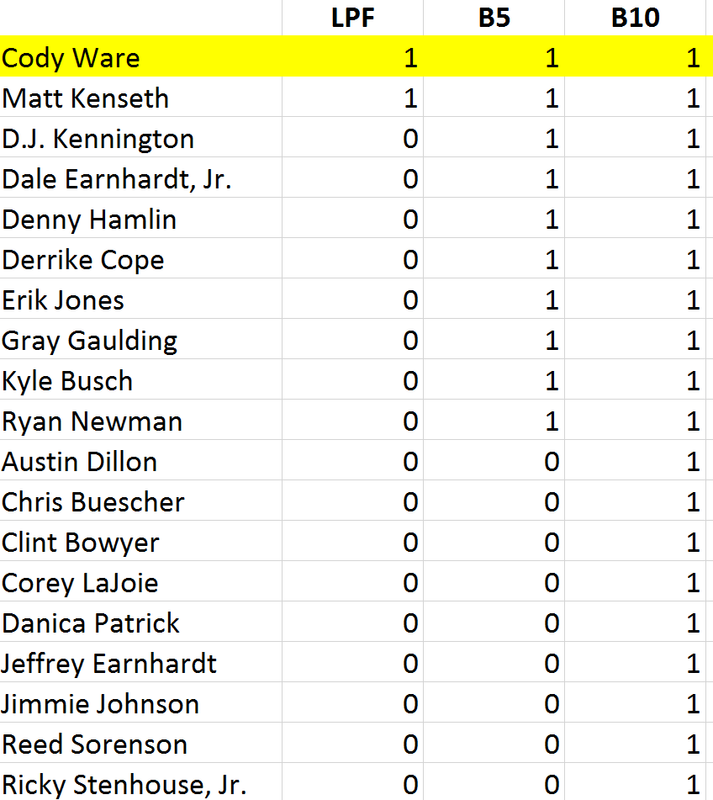 Ware is the first Cup driver to fall out at Atlanta for that reason. I was listening to the #51 scanner and they pulled it behind the wall after sitting on pit road for a few minutes because of a left front ball joint problem ultimately. Is the points system still one point per position? (with the addition of segment points, of course). For both the last 2 Cup and Xfinity races, the bottom 5 have all been assigned only 1 point (aside from bonus points from the earlier segments). In this race, for example, Derrike Cope only got 1 point, despite finishing 4th to last. Do you know why this is? (It doesn't seem to be the case in the Truck Series, it is still 1 point per position there). @Jesse - Nope, NASCAR changed that this season. Every member of the Bottom Five in Cup and XFINITY gets just one point for ranking there at the finish.